A note of our meeting at the Collective on March 5th is now available at our page on newsletters, slides and meeting notes. The slides used at our meeting are also there, including those provided by Cargiant/London & Regional Properties. For more news on the forthcoming public hearings on the OPDC Draft Local Plan, see the post for March in the right hand column of this page. Old Oak is a part of west London lying at the heart of the UK’s largest urban regeneration project. It is the location of the planned HS2/Queen Elizabeth Line rail interchange, due for completion in 2026. Since April 2015 the Old Oak and Park Royal Development Corporation (OPDC) has been the planning authority for 650 hectares lying within the London Boroughs of Ealing, Brent, and Hammersmith & Fulham. The OPDC is accountable to an appointed board, and ultimately to the Mayor of London. Because of its future connectivity to the national rail system, Old Oak has been earmarked for many years as one of London’s major ‘opportunity areas’. The rail interchange is seen as a catalyst for high density commercial and residential development, in the same way that the Olympic Park was created as the core of a new part of East London. Back in 2015, a target of 24,000 new homes at Old Oak was set in the revised London Plan. This target remains in the new Draft London Plan, and has reappeared in 3 successive draft versions of the Local Plan being prepared by the OPDC. Many local people feel that this target was not based on adequate analysis of the development capacity of the area. There is growing evidence that the housing densities required to meet an inadequately assessed housing target only be achieved through built forms (clusters of residential towers) that are at densities and heights well above London norms, and closer to the extremes at Isle of Dogs (Isle of Dogs in East London is another Mayoral Opportunity Area, where 6 of the tallest residential buildings in Western Europe now have planning permission at 57-75 storeys). When coupled with an already congested road network, local people have problems envisaging a future Old Oak with ‘development that will pioneer international excellence in sustainability, health and wellbeing and design quality to deliver tangible benefits for both local communities and London’ (OPDC ‘Our Spatial Vision’ from Draft Regulation 19 Local Plan). The aim of the Old Oak Neighbourhood Forum is that existing residents in the area have at least a modest say in the future of this part of London. Much of Old Oak has remained as industrial and railway land, bisected by the Grand Union Canal. In 2015 a group of local residents associations in the area came together as an ‘interim’ neighbourhood forum. Our aim was to achieve designation of a 280 hectare Old Oak neighbourhood area, and to prepare a neighbourhood plan which would help to integrate the existing residential settlements within and around the edge of the OPDC boundary. After many months of discussion with the Corporation and with Hammersmith & Fulham Council, both these planning authorities rejected the boundary we had proposed (shown in blue on the map below). In September 2017, the OPDC designated a much reduced 22 hectare are in East Acton (see green boundary below). Hammersmith and Fulham Council designated a separate (but nearby) boundary as the old Oak Estate neighbourhood area (see brown boundary below). Details of the reasons for these decisions, as published by each authority, can be found here and here. Following a further designation application, the Old Oak Neighbourhood Forum was designated in February 2018. This body has the legal powers to prepare a neighbourhood plan for the 22 hectare area that includes the Wesley Estate, the Island site (TITRA railway cottages), Midland Terrace/Shaftesbury Gardens and Wells House Road. No organisation has yet come forward to apply for designation as an Old Oak Estate Neighbourhood Forum, in Hammersmith & Fulham. This area remains one of two ‘orphan’ neighbourhood areas in the Borough. 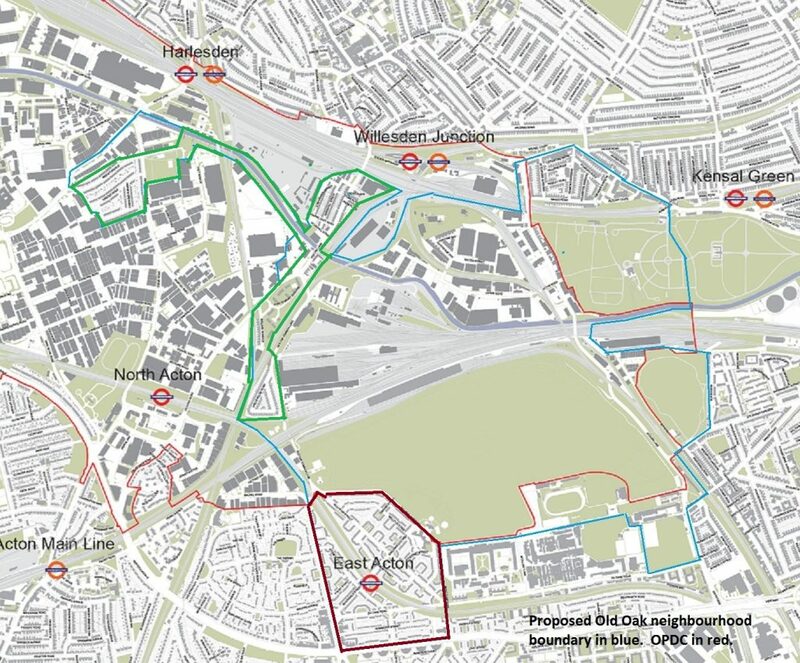 The original proposals for a much larger Old Oak neighbourhood were well supported by local residents in the 2017 public consultation carried out by OPDC and LBHF in mid 2017. The Forum held its inaugural meeting in May 2018. Its membership remains open to ‘full members’ (i.e. those who live or work within the 22 hectare boundary) and to ‘affiliate members’ (those who joined the earlier interim forum and others across this part of West London who take an interest in the future of Old Oak). Please get in touch by emailing oonforum@gmail.com if you wish to join the Forum as a full member or an ‘affiliated member.’ There is no membership fee to join. The OPDC has finalised its preparation of a Local Plan, and this has been submitted to the Secretary of State. The document, and all accompanying material, can be found here on the OPDC website. The next stage is for the Draft Plan to undergo an Examination in Public (EIP). The Old Oak Neighbourhood Forum, along with other local organisations, will be making further representations to the Planning Inspector appointed to undertake the examination of the OPDC Draft Local Plan. Other pages on this website give more details of who we are and the story so far.